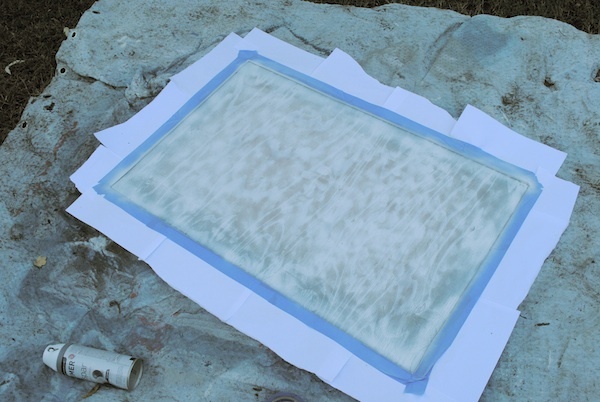 It's that time of year again to take on one of our favorite pinterest projects that we have been dying to actually complete. Thanks so much to Sherry, Katie and their co-hosts Sarah and Carmel for hosting this awesome and fun challenge for all of us bloggers out there! So pretty right? 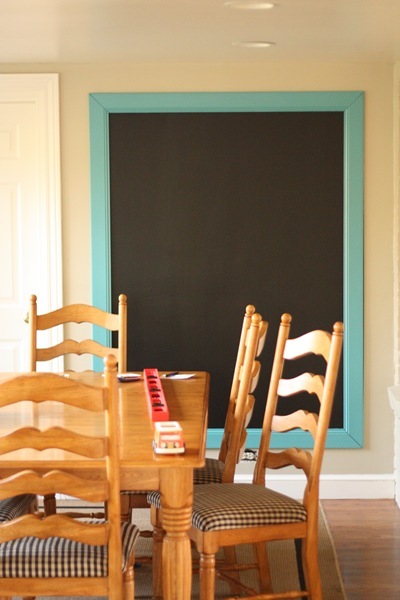 She actually painted her chalkboard paint directly onto the wall and then framed it herself. Love that. We have a pretty small kitchen plus a chair molding and different things going on so I couldn't quite figure out how I could do this. 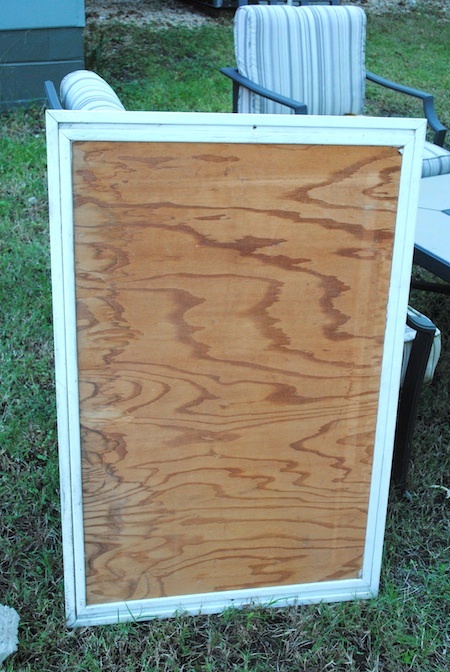 Then, sometimes you just so happen to be cleaning out your overstuffed shed (for the third time) and remember that you had come across a great piece of framed wood that you were saving for a someday I will make this into something pretty project and it just clicks - this is like the perfect chalkboard waiting to happen, such a great score. I have no idea what this was/is, it was just left here by the previous owners and I couldn't throw it away. 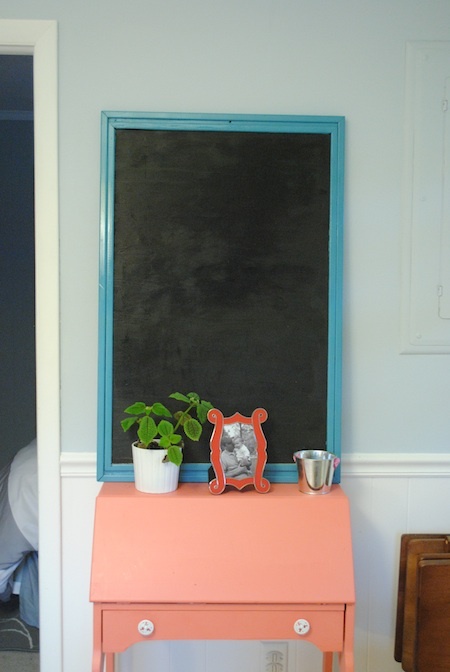 I decided to use the chalkboard paint in spray paint form (only because I already owned some) and then to spray paint the molding a teal (only because I had some of that too). This was some old, dry wood and it took a mighty good helping of primer. I ended up giving it two good coats and then some touch up with a third, I just felt like it needed a good base. After that, I spray painted the trim teal and let it dry. Next, I taped off the trim really well so I could spray the center with the chalkboard paint (each received two coats). And then a few days later of spray painting in between fifteen other projects and naps, I had this! 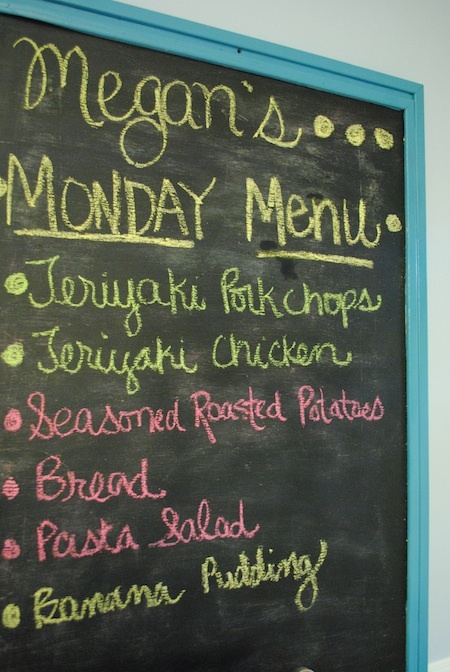 I absolutely love it and Justin has declared to me that He loves a chalkboard in a kitchen so we are all about this chalkboard right now. This guy did replace my little memo board I made a while back but don't weep for him because it got a new life once again and has found a new home...more on that soon. So, that's my little pinterest project! Can't wait to check out everyone else's! Make sure you head on over to the link up and see all of the amazing projects! Thanks for stopping by today! Hope you have a fantastic day! That turned out so cute! One of these is definitely on my to do list! Very cute! I think chalkboards are great too. I don't have room now, but I'm keeping the idea in mind for the future! I would love to have one in a kitchen too, or an office, or mudroom. Adorable! Such a cute little nook. I would LOVE for you to link this up at my Ginger Jamboree Link Party!! 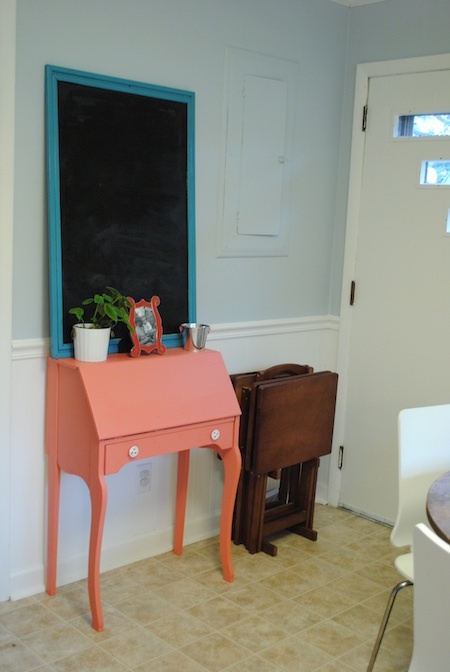 Not only do I love the chalkboard, I love the little coral secretary it's sitting on! Super cute. My husband isn't cool enough yet to allow such fun colors in such major rooms...but we're working on it. Great job! PS When can I come over for dinner?! just came over from YHL... a chalkboard menu is so cute! Thanks so much for stopping by! I'm kind of obsessed with chalkboard paint :)!! Nothing is safe in our house, haha!